Although a comparatively small, landlocked, country, Nepal’s geography and topography are perhaps the most diverse of any land of similar or even larger size in the world. It comprises three geographical zones from north to south: the greater Himalayan zone in the north, aligning with the frontier with Tibet/the People’s Republic of China; the lesser Himalayand Mahabarat ranges in the centre; and the Terai zone — flat, and the northernmost part of the North Indian & Gangetic Plains region of south Asia — on the south. The southern and eastern and western frontiers of Nepal border the Republic of India. The geography of the country has not only shaped its history from the earliest to current times, but also patterns and types of settlement, economic development and agriculture. The latter being shaped from the earliest times by where particular plants, cereal crops [such as millet as well as rice] and herbs thrive – Nepal has perhaps the widest range of these of any Asian country, given its size — and are used for a wide range of Nepali local and national cuisines: similarly the nation’s terrain has determined where and to what extent particular forms of livestock exist and can thrive — from the Yak to sheep and buffalo. In addition it has played a substantial part in the development of many different cultures and forms of spiritual and religious beliefs. Often local gods & goddesses of specific locations associated with legends, and perceived to be spiritually-charged with particular attributed powers and characteristics, relate either to regional or local beliefs and mythologies, or to Nepali Hinduism — Tantric and other — or Nepali Buddhism, which in turn are part of the broader global Hindu & Buddhist religions and spiritual philosophies). 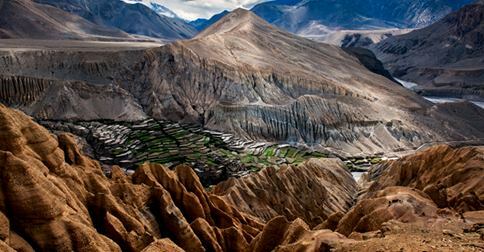 ‘I have seen the Earth Change’ — documentary film about climate change in the Himalayan regions of Nepal.